The Prince Harry & Meghan Markle Christmas card is ridiculously romantic. The previously unseen photo from Prince Harry and Meghan Markle's wedding reception. When Meghan Markle and Prince Harry married in May this year, the world stood still. Men, women and children from around the world gathered in front of their televisions to watch the Hollywood actress walk down the aisle to marry a prince. In the days that followed the photos were carefully observed. Every detail of Meghan Markle’s dress, and every look Prince Harry gave her in the church, were reported by media outlets worldwide. It was the love story 2018 needed. And boy did they deliver. But there was one very special photo kept from us back in May and oh. It is very very romantic. 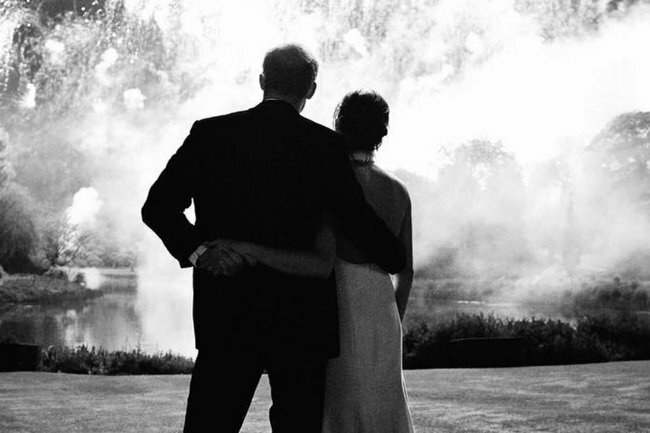 The photo, which was posted on the Kensington Palace Instagram account, shows Meghan and Harry with their arms firmly around each other, as they look towards the fireworks in the sky. In the caption, Kensington Palace announces that the image will be on Meghan and Harry’s Christmas Card this year. As if we need another to reason to gush over The Duke and Duchess of Sussex’s adorable relationship?